All doors (and trunk) are locked if the lock button is pressed. The hazard warning lights blink if the lock button is pressed once. The hazard warning lights blink and the chime sounds once if the lock button is pressed once more within 4 seconds to indicate that all doors (and trunk) are locked. The hazard warning lights blink and the chime sounds once to indicate that all doors (and trunk) are locked. However, if any door (or trunk) remains open, the hazard warning lights and the chime will not operate. 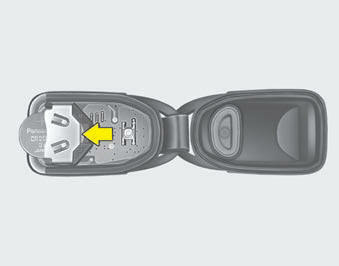 If all doors (and trunk) are closed after the lock button is pressed, the hazard warning lights blink. The driver's door is unlocked if the unlock button is pressed once. The hazard warning lights will blink twice to indicate that the driver's door is unlocked. All doors (and trunk) are unlocked if the unlock button is pressed once more within 4 seconds. The hazard warning lights will blink and the chime will sound twice again to indicate that all doors (and trunk) are unlocked. After depressing this button, the doors (and trunk) will be locked automatically unless you open any door within 30 seconds. The trunk is unlocked if the button is pressed for more than 1 second when all doors are locked. The horn sounds and hazard warning lights flash for about 30 seconds if this button is pressed for more than 0.5 seconds. To stop the horn and lights, press any button on the transmitter. • You exceed the operating distance limit (about 30 m [90 feet]). • The transmitter is close to a radio transmitter such as a radio station or an airport which can interfere with normal operation of the transmitter. When the transmitter does not work correctly, open and close the door with the ignition key. If you have a problem with the transmitter, contact an authorized KIA dealer. years of trouble-free use, however it can malfunction if exposed to moisture or static electricity. If you are unsure how to use your transmitter or replace the battery, contact an authorized KIA dealer. • Using the wrong battery can cause the transmitter to malfunction. Be sure to use the correct battery.